Scroll through our calendar. Find a painting that you like and on a night that you want to have fun. Then call your friend(s), reserve your spots by paying online and then get excited! Bring your Paint Face. We’ve got the rest—paint, brushes, a canvas, and apron. Arrive up to 30 minutes but at least 15 minutes before the painting begins. Upon your arrival, find your name written on a paper plate that is next to each easel. If you notified us in advance that you are part of a group and we have an error in our seating arrangements please let us know. We will make ever attempt to remedy the situation. A restaurant waiter or waitress will be available to supply you with food and drink for the evening. If you feel that the server has not responded to you in a timely fashion please let us know. “We will hunt them down.” This is an exciting time but please inform the server about your tab payment arrangements as this could prevent end of the night scrambling to divide up the check. We know you would rather be rushing home to show off your painted masterpiece. You will find an easel, a canvas, a cup of water, a rolled up paint cloth that holds your brushes and an apron at your seat. Put the apron on to protect your clothing. Please wear comfy clothing that won’t cause you to freak if a drop or two of paint falls on it. “Splatters Happen!” We do not judge people by the clothing they wear but we will judge you if you don’t wear clothing. There will be large paint bottles with pumps and a styrofoam divided platter (palette) on a table in the room. Go get your paint. There will be specific instructions on how many pumps per color and the location of each color on your palette on the table. If you put the paint in a different section than was instructed don’t worry. It’s all good. Sometimes there will be color choice to make when filling your palette. This is when your creative juices start flowing. All of our paintings are created by Kathy. 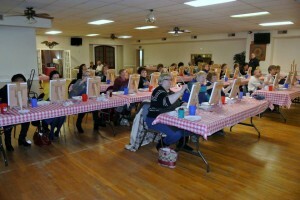 Sure some look difficult and you might think, “I can’t paint that and have fun.” See our Gallery for some examples of previous sessions. Don’t those people look like they’re having fun and their paintings look great?? You needn’t an ounce of artistic skill. You’re going to help replace “I can’t” with “I can” and “I did.” Our canvases will have partial or fully drawn images of the painting. However we do encourage free expression and willingly offer anyone the opportunity to decline this service and just do their thing. 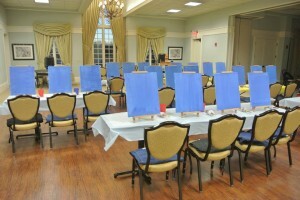 Just let us know prior to the event if you want a blank canvas and you’ll have it. So let’s get painting. Kathy will guide you through the step by step process and offer individualized instruction to anyone in need. 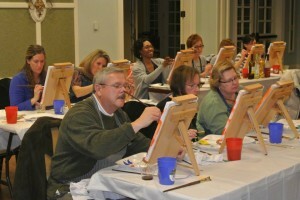 This is your time to have fun and let us help to bring out your inner Picasso. Don’t forget your beverage helps to lubricate the process. Instruction is 2 to 2 ½ hours long and attempts will be made to pry the brushes from people’s hands to take a break. You won’t believe where the time went as you complete your masterpiece. We like to take a group photo of everyone with their paintings at the end of the event for future website and Facebook postings. We can also take individual and group photos as a memento. Our photos will be posted to Facebook within 12 hours after the event. We encourage people to tag their photos and share with friends. Please let us know if you want to decline from the photo session. Take your masterpiece with you and hang it in your home, bring it to the office, or give it to someone special as a gift. And tell everyone how much fun you had at a Spirited Sisters Studio Sip & Paint event and plan to attend another in the near future.